Click here to read review of the Kansas City production of Rosary O'Neill's Marilyn/God: Review by Meagan Meehan from Breaking Character Magazine - the online magazine of Samuel French Publishers. This dramatic Comedy captures the effervescent humor of Marilyn Monroe confused and intrigued by the signs she must follow to climb her way into heaven. Marilyn has just died and must audition for heaven. Marilyn confronts voices in her head to validate her life as an actress. But her judges are her 13 aborted babies. Will she get into heaven? 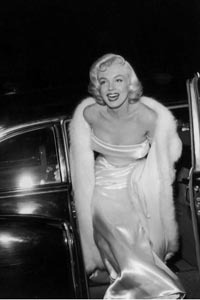 The play explores the multi-levels of complexity of cult goddess Marilyn Monroe--her vulnerability, anger, and loneliness and the ways that American culture and the worship of beauty and fame shaped, aborted and forwarded her rise to stardom. In the afterlife Marilyn relives three painful scenes from her life and a life review and strains to justify her choices to male unsympathetic judges as well as to her aborted babies. The play was acclaimed in Norway and Kansas City and work shopped with the Actors Studio, NYC. two or more voices representing various people in Marilyn's life. The action takes place n the mind of Marilyn on an empty stage some time between 7:30 pm August 4th and 3:30 am August 5th, 1962, during Marilynâ€™s final hours. Will Marilyn get into heaven?